A lot of people are leaving Twitter these days. Social Justice Warriors aka Raging Douchebags have decided it is their duty to patrol the avenues of Twitter looking for something to be outraged about. Once they find it, they latch on to it like a Tijuana whore would a $10 bill. Deray McKesson, who was relatively unknown prior to Michael Brown’s death is attempting to be the current day Al Sharpton. Basically it means he gets paid to be a rabble-rouser. 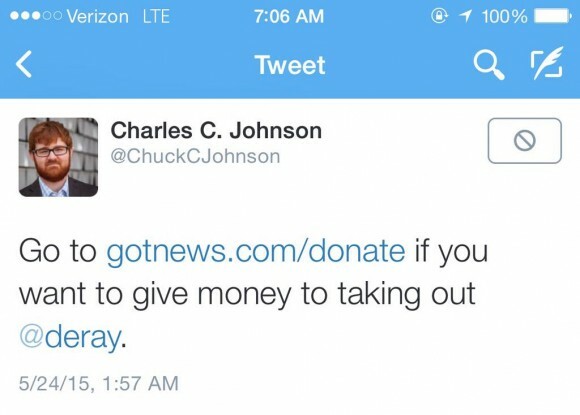 Chuck Johnson is an infamous Twitter troll who has made a name for himself “breaking” stories and releasing information about people not usually known to the public. Now, before we start breaking out the Kleenex for Deray over Chuck’s “threat”, it should be noted that aside from being a professional protester, McKesson is also not the sharpest knife in the drawer. Let’s be blunt: He’s a moron. The police are engaged in ethnic cleansing. America. One could of course take some time to explain to McKesson what ethnic cleansing actually is and refer him to actual examples but that would require some semblance of reason and I suspect that I would have an easier time reasoning with a rabid bear than I would with McKesson. Again, only somebody with nary a semblance of common sense and intelligence would believe Johnson was engaging in a real threat. She decided to expose herself as that person lacking in common sense and intelligence by actually having McKesson on the air to talk about this. Check out the video, courtesy of Digitas Daily. What’s so stunning about this interview is that Costello never once challenged McKesson on anything he said. Not a single time. That was it. Those were her questions. The “interview” lasted about 3 minutes and for nearly 2:30 of that, McKesson was allowed to talk, again with zero challenge from Costello. That this whole thing is actually a controversy is enough to hurt somebody’s brain. This is like the equivalent of two nerds in high school hitting each other with umbrellas. CNN decided to actually invest resources in the nerd fight and then decided to allow mini-me Sharpton McKesson to give his side without challenge. 2. How a paid protester with no credentials to speak of, can get himself on television. 3. Dark rimmed eyeglasses can make a person appear smarter, but Carol Costello is proof that they cannot hide stupidity.